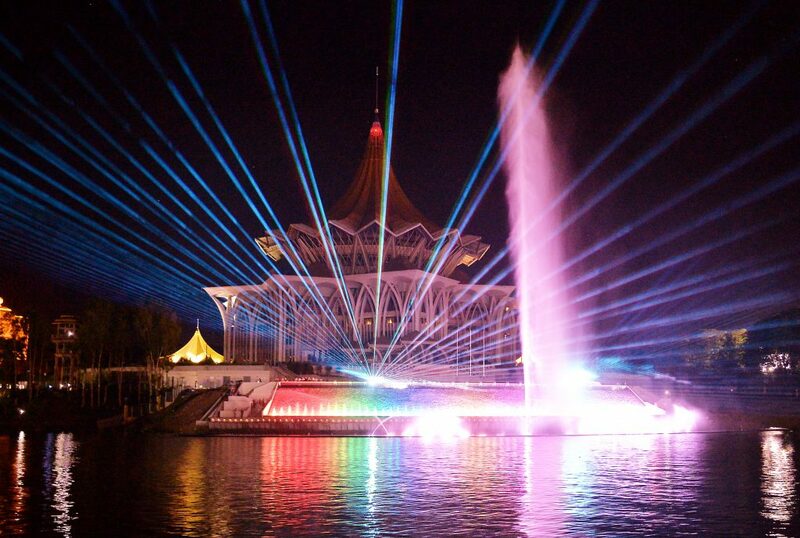 KUCHING: Effective last Sunday night until March 30, the Darul Hana Musical Fountain show will be held from 11pm onwards. The first show session for the new schedule will be from 11pm to 11.15pm while the second session will follow accordingly. This is a change from its usual daily show sessions (of 15 minutes each) which are from 8.30pm to 8.45pm and from 10pm to 10.15pm. File Photo: The Darul Hana Musical Fountain display on Sunday evening. The new show schedule is to make way for the Old Kuching Smart Heritage Agenda (OKSHe) themed “Empowering Smart Community” organised by the North Kuching City Commission (DBKU) in collaboration with the OKSHe and Sarawak Multimedia Authority (SMA) at the Kuching Waterfront from last Sunday night until March 31. The DBKU public relations division in a press statement yesterday apologised for any inconvenience caused. Its spokesman Azlan Mohamed said the public could call the division for any enquiries at telephone number 082-512 200 during office hours. The Old Kuching Smart Heritage Agenda is an event aimed at assisting the local community to adapt themselves to the digital world without forgetting the cultural heritage that forges their unique identities. It is also to showcase the local talents in addition to turning the city into a gateway for entertainment activities as well as cultural heritage. At the event, the public can expect to participate in activities that are fun for the family, competitive sports and games besides enjoying cultural performances, talks by university officials and leading health specialists, among others. Fountain show sessions rescheduled 0 out of 5 based on 0 ratings. 0 user reviews.